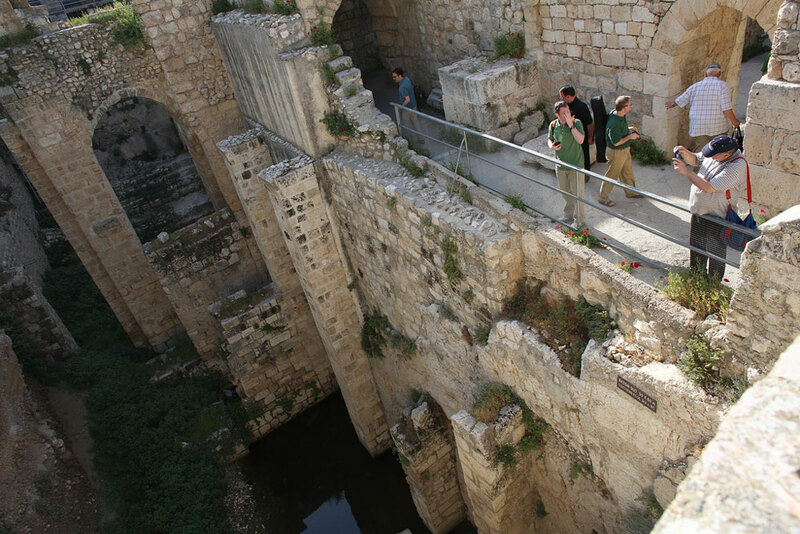 For thousands of years, people have moved in and out and around the land of Israel as if on a cosmic conveyor belt—in, out, around, and also down, deep down into the Earth. 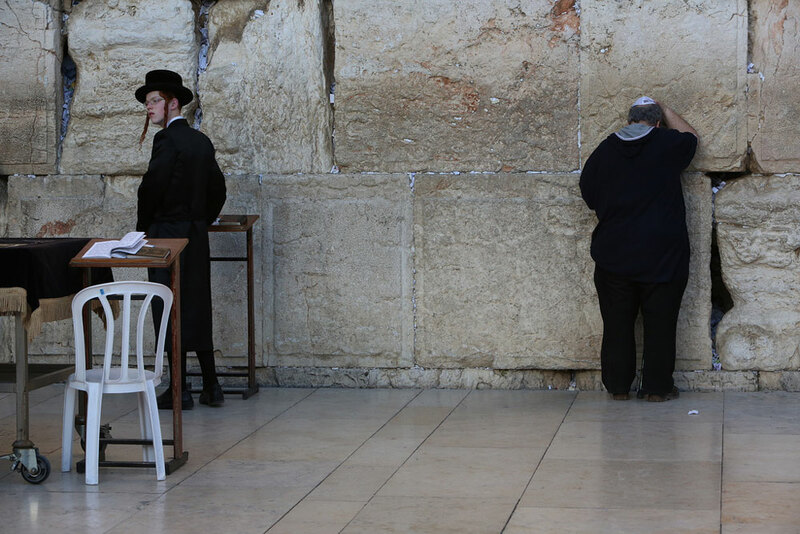 In Israel, every bit of wall you can see stands for thousands of years of walls unseen. An anonymous, grassy hill on a roadside is 20 layers or more of competing civilizations in Israel, each layer crushing the other, informing the other, and also protecting each other from the forces of Nature that, eventually, come to erase them all. Israelites overtaken by Persians overtaken by Greeks overtaken by Romans overtaken by Arabs overtaken by Crusaders overtaken by Mamluks overtaken by Ottomans, etc. — and on top of the hill, some grass, maybe a goat. Israel is a story of human occupation and also human abandonment. If Israel could be seen on a map of time, you would see layers of people crashing into each other, collapsing on top of one another, pushing each other out, passing each other by, just missing each other, wandering away from each other, buried upon one another. Israel is thick with the endeavors and failures of people. 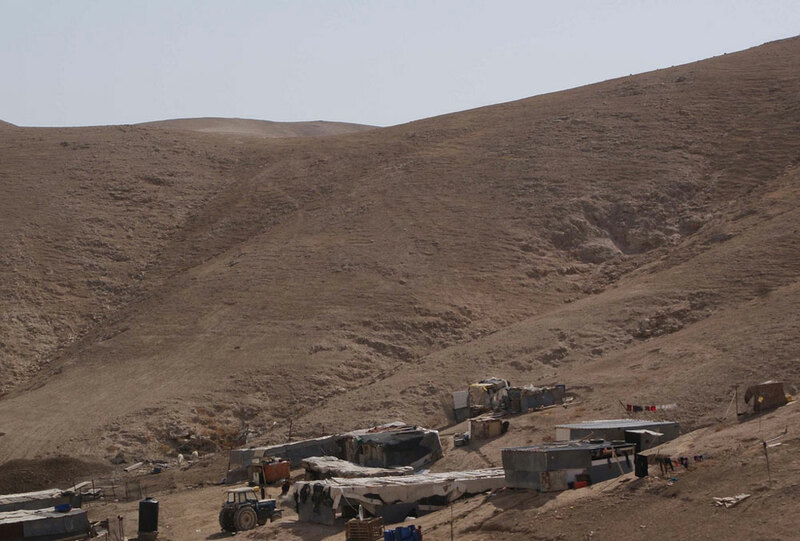 Home, in Israel, is unstable and always has been. Israel is forever re-organizing her temples, transmogrifying her language. In Israel, we start to wonder if “home” has ever been a place of respite or peace — if it isn’t, instead, a battle, a battle against Time, an attempt to make sense out of our existence on Earth, which comes out of nowhere and seems to go nowhere. An attempt to settle down in a world in which we are only renting out space. In Israel, one is confronted with the possibility that “home” is not a place you get to but rather the name of a longing. In the waiting room of the airport gate that leads to a long passage leading to Israel, the men gather in a corner. They open their books, point themselves east toward the runway, lean forward, and pray. The young Orthodox man sitting next to me on the plane smiles for the first eight hours of the flight. He watches the television on the seatback like someone who hardly watches TV. At some point in the endless night of airplane time, I awake and see his smiling face and rumpled black suit slumped onto the still-moving screen, resting at last. It’s a strange feeling, going to a place you have never been and being told that it is, ostensibly, home. On the plane, I start getting used to the rhythm of Hebrew. It still seems impossible to me that this is the living language of Israel. Even Theodor Herzl never expected his Jewish pioneers to learn Hebrew. The very idea was absurd. The Jews of Israel would speak their respective languages, wrote Herzl in The Jewish State, until one dominant language prevailed. For all Herzl could tell, the official language of the future nation of Israel could easily have been German (though he hoped it would not be Yiddish). These are words I learned as a child, living far away from the land of their source. The words came to me in fragments, and have stayed with me in fragments. As a child, I learned the Hebrew alphabet too, which, I discovered this morning, I can still sing. 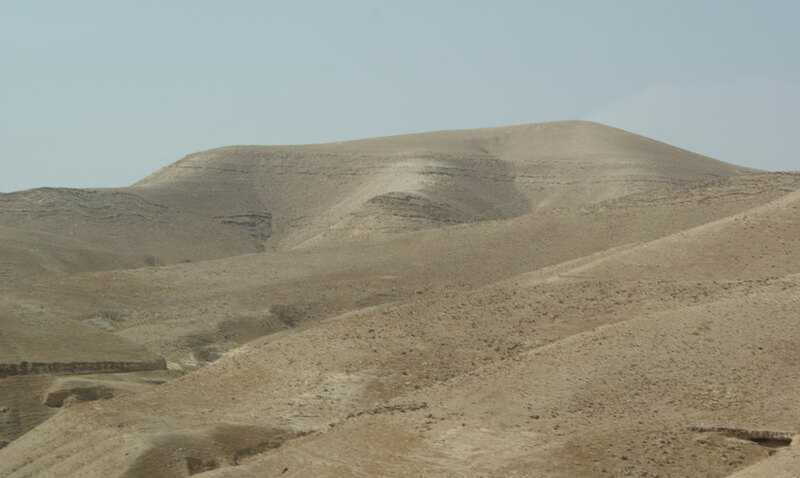 O picks us up from the airport in his borrowed minivan and explains the dents as “Jerusalem driving.” Here is how the landscape ascends, he tells us as we head along the highway, from Tel Aviv to Jerusalem. As we climb, we wonder whether this very ascent explains why people started worshipping upwards. They were raising their heads upward not toward the heavens, but toward Jerusalem. Now are the olive trees, now the architecture that triples back on itself, now we are driving through an abandoned 7th century Palestinian graveyard that is worn and lonely like the new Jewish cemetery in Lublin, Poland. There, O says pointing, is a little mountain I like to call Zion. O, a recent transplant to Israel from Michigan, has a convincing accent when he says the Arabic and Hebrew names of things. He suggests a drive through the Old Town as the sun lays a yellow glow over the city walls. Inside the passages, our car is stopped by a procession of black Armenian robes emerging from an ancient wall. The first thing that must be done, Y tells us when we come to our rented rooms in Rehavia, is that Moshe must be fetched. He did not have time before your arrival, Y explains, to fix the Philips Recordergram. Y has decorated our rented room – the former office of an orthopedic surgeon – with old typewriters and sewing machines and the belongings of Rehavia’s disappearing German inhabitants that Y has rescued from the street. Near the sink, made into a kitchen area, Y has placed citrus fruits and tea he bought at a market in East Jerusalem. We take our things from our suitcases and put them on the doctor’s bookshelves as Moshe places neat piles of electrical wire and casing on the carpet. As Moshe works, Y tells us that his grandparents immigrated to Israel from Yemen in the 1950s. Y has never been to Yemen, of course, but feels close to his Yemenite roots. The Philips Recordergram starts scratching out ‘Tangled Up in Blue’. Y asks me if I know any Hebrew. The Palestinian graveyard is across the street from what Y calls the Temple of Shopping — a new shopping center of stones built around the remains of an old shopping center of stones. The old stones are numbered and stacked oddly, and look like prisoners posing for a group photo. In front of them stands a cigar store Indian. The morning air sounds off with the cries of bulbul birds. 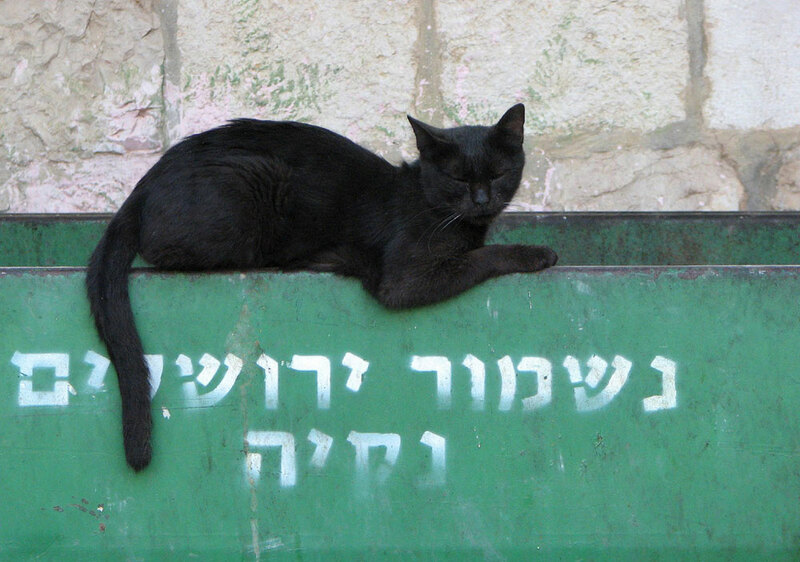 In every corner of Jerusalem is a cat. 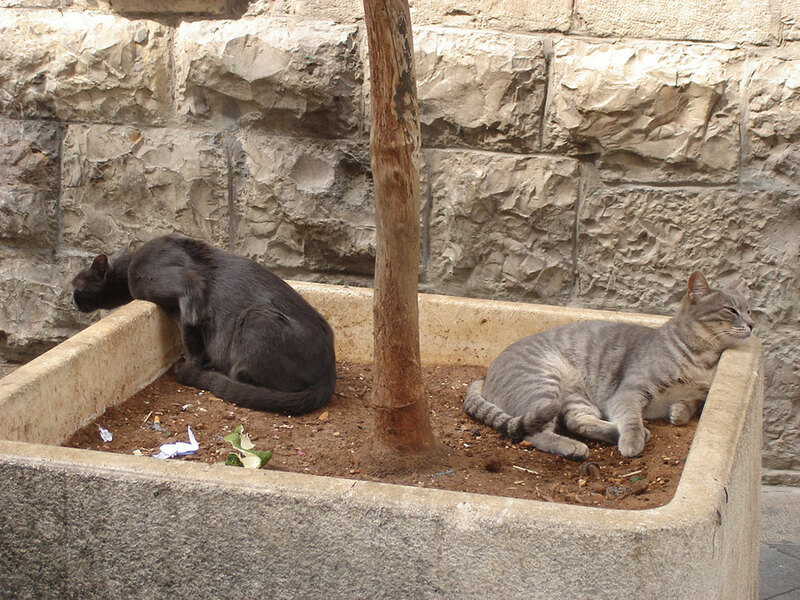 The street cats of Jerusalem guard the banks and the bushes. They are large and solid and no one pays them notice. I ask Y if anyone ever visits the Palestinian graves. He tells me that no one does, but that there are plans to build on the site a new Museum of Tolerance. Back in the Old City, we wind through the Via Dolorosa and into the Islamic quarter where cloaked women sit on the ground and sell tidy stacks of grape leaves. We happen accidentally upon some Stations of the Cross — VIII, I think, and then III and IV together. On St. Francis Street, I smile at a man with a giant blue face who lingers on the corner, only I cannot tell if he smiles back. 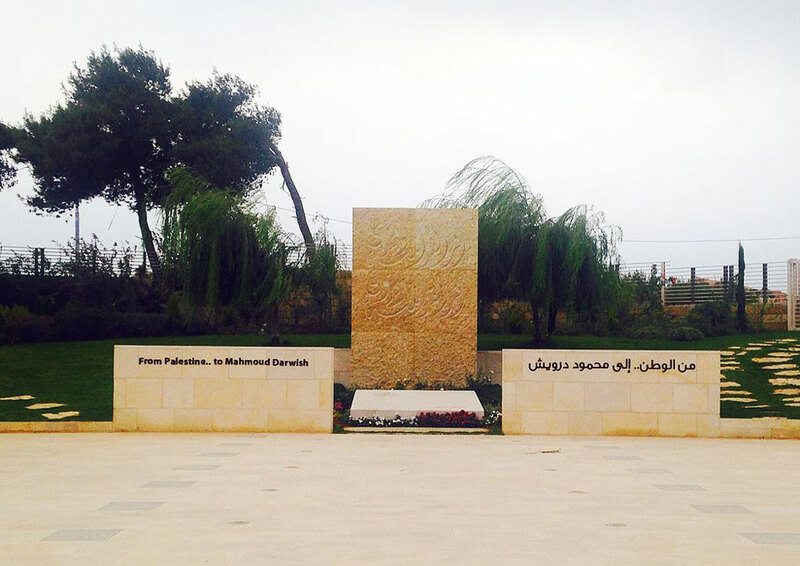 The great Palestinian poet Mahmoud Darwish is buried in the Palestinian territory of Ramallah. They’ve built a museum of Darwish in Ramallah, where Darwish lived briefly near the end of his life. Darwish’s name is now eternally associated with Ramallah, but Darwish never really felt Ramallah was his home. Darwish was born in the North of Israel, near Haifa — he had seven years of memories there before Israeli military forces expelled Darwish and his family from their village in the summer of 1948. After that, Darwish lived in Lebanon, Damascus, Tunisia, the Soviet Union, Cairo, Beirut, Paris. But no place was ever home. “I had never been in the West Bank before,” Darwish told The New York Times in 2001, speaking of his move to Ramallah. “It’s not my private homeland. Without memories, you have no real relationship to a place.” And so, with this, we learn one of the requirements of home: A home has got to have memories. But looking back, wrote Darwish, is also “one of the attributes of exile.” When the future is filled with fear, wrote Darwish, and the present is unbearable, the past becomes long. When you say to your family: I have never tasted anything worse than fish oil in my life, the elders ridicule you: Do you even have a life yet, you are still seven, do you even have memories? You say: Yes. And just like that, the past – for the child Darwish – was born, “born suddenly,” he wrote, “like mushrooms.” Born “out of absence.” The past, for Darwish, became the keeper of hope. His dreams were not to be realized in the future but in the past—“a distant past,” he wrote. Darwish’s exile fed his dreams, and his dreaming fed his exile. Exile was Darwish’s condition. From the age of seven, exile was Darwish’s home. 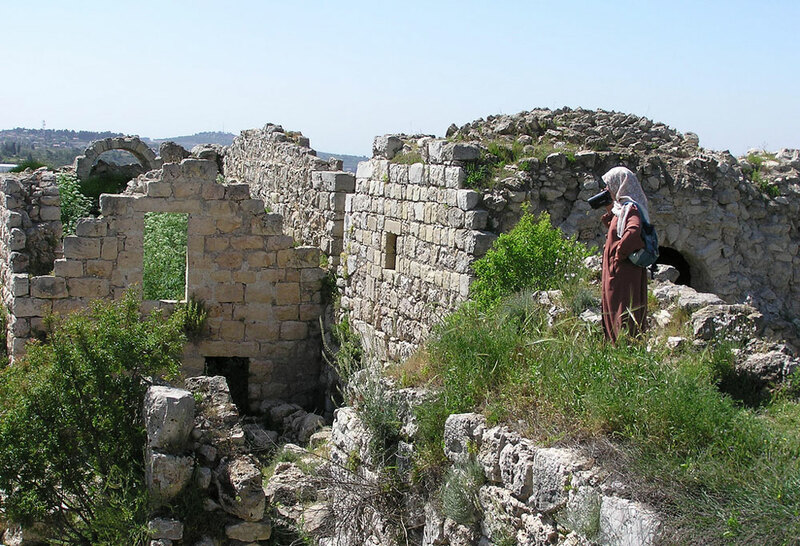 On the fringes of Israel, the pilgrims roam, as they’ve been doing for thousands of years. They file out of tour buses and wander in clusters, collecting bits of the Holy Land to take away to their countries. 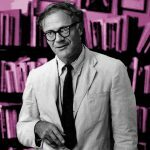 Mircea Eliade wrote that pilgrimage is second nature to people, that we have been acting on the urges of pilgrimage since prehistoric times. People, wrote Eliade, have pilgrimage in their hearts. We are forever seeking to return to a mythical source, a place of origin, a home. The word ‘pilgrim’ means foreigner but Israel hardly exists without pilgrims; pilgrims are unofficial citizens of Israel. Every day I see American Christians who have come to Israel from their peaceful, inconsequential American towns and cities, to experience the sacrifice and violence that helped create the Israel they are hoping to find—to put their knees on the sites where Christ fell, to search for drops of blood on the cobblestones, to locate any pool of water that might feed their inner quest. During Purim week, I watch the pilgrims watching the Israelis who are dressed in hula skirts and moose heads and blue wigs for the holiday. I wonder if they wonder: Does that Israeli man always wear a huge gold dollar sign around his neck? Do the girls always dress like princesses? Why would a grown man in Jerusalem wear a monster mask on such a lovely spring day? And what does it all mean? Because nothing in Jerusalem, as everyone knows, is done without meaning something. To write his stories, Agnon grabbed details from the Buczacz of memory – a particular menorah, the certain position of a book on his father’s shelf, the celebrated belly of a man he once knew – and arranged them on paper. There was the real Buczacz, which was once a living place of the present, and there was the Buczacz Agnon had created, which was only of the past. This second Buczacz of the past was neither living nor dead. The Buczacz of Agnon’s stories was something of a zombie world, like the Israel Agnon had grown up reading about, a Jewish Utopia without its Jews, a place that was no-place at all. 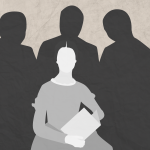 The young Shmuel Yosef Halevi Czaczkes took his pen name, Agnon, from his signature story “Agunot.” In Jewish Law, an “Agunah” is a married woman whose husband has gone missing. She cannot be remarried unless she is granted a divorce from her husband—yet her husband is nowhere to be found. Not knowing whether he is alive or dead, the woman remains legally “anchored” to her husband; the word “Agunah” comes from the Hebrew word “Ogen,” which means “anchor.” Thus, the Agunah lives in a state of limbo – married and not, single and not – unable to move forward yet denied the right to her past. Over and over in Agnon’s characters, we see a community of lost souls, caught between worlds, between states of being, tragically anchored to that which they long for but can never seem to possess. The limbo state of the Agunah is a fellow to the word ‘promise’. A promise is something the past gives to the present so that those in the present may look to the future. Living for a promise is like being nowhere and everywhere. If the promise never comes, life is lived for the future. And if the promise does come, the past must be erased. By the time Agnon decided to write his Buczacz stories, the Buczacz of Agnon’s childhood was gone — and so was Agnon’s childhood Israel, the Israel-as-dream, the Israel as it appears in most of the Hebrew scriptures. Israel had become a nation state, a home for the Jews at last, a real place in which Agnon actually lived. In the morning we rise early and begin walking early. 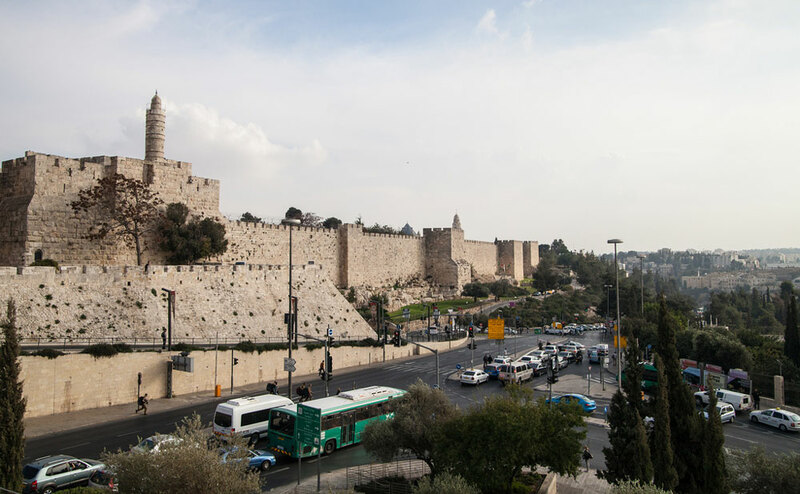 We head back to the old city, back through the temple of shopping, back to the cobbled streets with their treacherous and primitive handicap ramps, back to the faded posters of Jesus and the new antique pottery and the walls and walls and walls and the cups. A procession of grinning Ethiopian monks float by. At the bottom of stone steps, a trio of Palestinian girls in school uniform stand in gossip formation with their heads bowed into each other. As we leave an empty alleyway, two cats climb out of a Dumpster behind us. 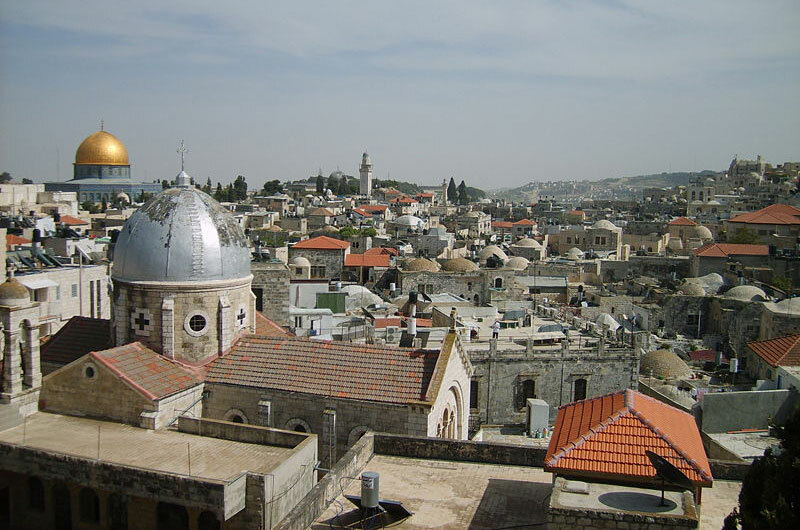 In the afternoon, O takes us to Ein Karem, the place where – says legend – John the Baptist was born. After lunch we walk over to Mary’s Spring, the end of a Roman aqueduct with a green hose running through. Here, says the story that started in the 14th century, is where Mary met with Elizabeth, and where the Virgin Mary drank, only today (the signs tell us), the water is not potable, and there is soon to be a hotel nearby which will likely drain the spring altogether. The holy spring was renovated by the great Zionist banker Baron Edmond de Rothschild, who sent many Jews to Israel during the course of his life, though he died at his château outside Paris. Ein Karem is a town out of a picture book, with stone houses that wind through their gardens, and vines and olive trees and mountains that terrace with green and rocks, and multiple monasteries, one being a Russian Convent holding a cave that many believe was the church where John the Baptist preached. Artisans who paint tiles and pots have settled into this mountainous village and placed pots of cyclamens on their doorsteps. 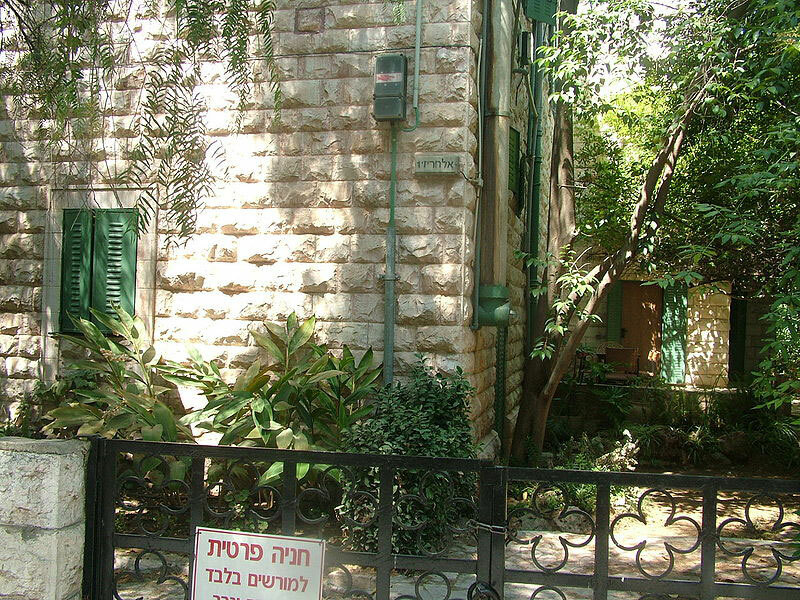 In 1948, Ein Karem was cleared of its Muslim inhabitants and re-populated with new Jewish immigrants. 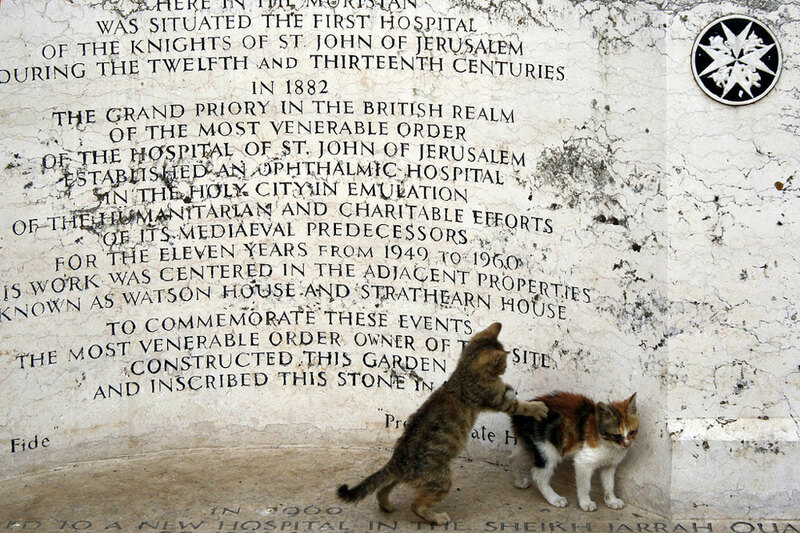 It is a special place in Jerusalem, being among the few depopulated villages the buildings of which still remain intact. 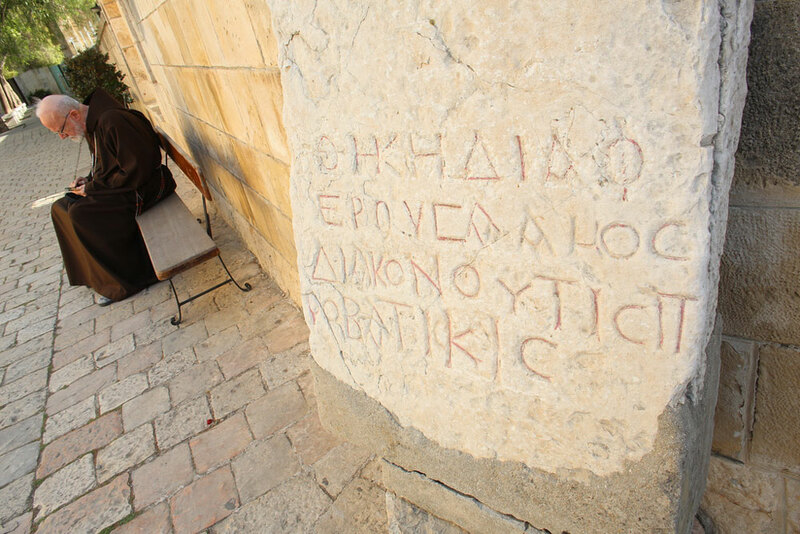 In the Alexander Nevsky Cathedral, a man chants near a piece of the rock of Calvary that sits near the threshold where they say Jesus walked out of Jerusalem to be crucified — across from the man, a Russian nun stands praying before the Judgment Gate. Her words disappear into the deep hum of the drills of Russian archaeologists in the basement of the church. The man at the rock has his right hand outstretched on the stone, and in his left hand he holds an iPad, from which he reads his prayers. The walls of the Alexander Nevsky Cathedral are strung with icons strung with trinkets and jewels, and paintings of extinct Russian nobles. In a row of unlit cabinets near the altar are dusty bits from Gethsemane, and the air smells of incense and candles and the perfumed headscarves of pilgrims. Outside the doors the of the Cathedral, bearded men daven at the Western Wall in the dying light of the day, nodding and nodding into the stones. The call to prayer repeats from the Mosque of Omar and the bells of the Holy Sepulchre ring into the candle flames. Men in shops sell stuffed camels, and rosaries big as legs, and t-shirts that say FREE GAZA, and hats that say ISRAELI POLICE, and pink plastic laundry bins stocked full of shofars. 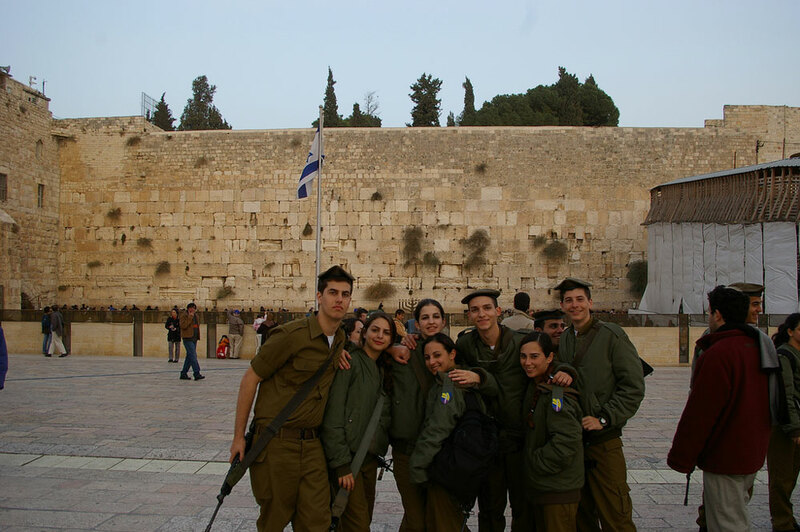 One thing that cannot be ignored about present-day Israel is the ubiquitous and permanent presence of armed teenagers. At the bus station, armed teenagers lean against windows and eat falafel at falafel stands. There are armed teenagers grouped at holy monuments, with M16s slung under their armpits, and armed teenagers walking home. Because national army service in Israel is mandatory for all Israeli citizens over the age of 18, the country always looks like it is at war, even when it is not. My cousin’s husband, an agricultural man born on the kibbutz he still lives on, which his father helped to create, points to topographical details along the road: red wildflowers and Israeli irrigation, of which he is particularly proud. He tells us that the green we are admiring on the hills just outside of Jerusalem will be dead within weeks as the dry sun gets hot enough to bake the life from the grass. I point to a group of camels grazing on top of a hill of plants and stones. Camels, he repeats, utterly unimpressed. Scattered along the creases of the hills are shantytowns of the once-nomadic Bedouins – piles of corrugated tin and wood scraps and canvas. 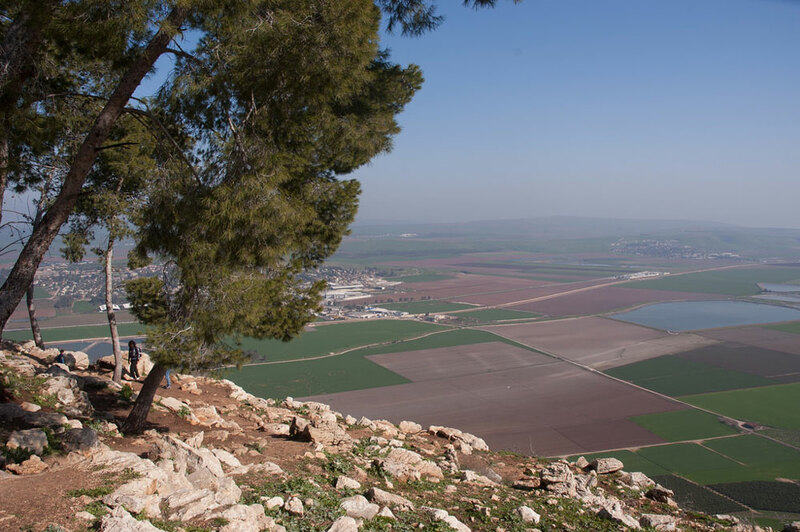 Later, on Mount Gilboa, we look for wild irises and are told the names of the wildflowers. The flowers, says my cousin’s husband, are native. But along the ridges of the Biblical mountain are leaning legions of dying pine trees, planted decades ago by settlers, my cousin says, to counteract the clear-cutting that the Ottomans had done. The pine trees, he says, were not native, and never took to the land, and have been slowly wasting away for twenty years. The trees can’t be removed, he says, for it is illegal to chop them down, and illegal to replace them. But one day, he says, the trees will be dead and better trees can then be planted in their place. I looked out the car window. In my mind’s eye, I saw a tin charity box on a shelf in the kitchen of my childhood, loose change to plant trees in Israel. I wondered were these the trees my American quarters planted. 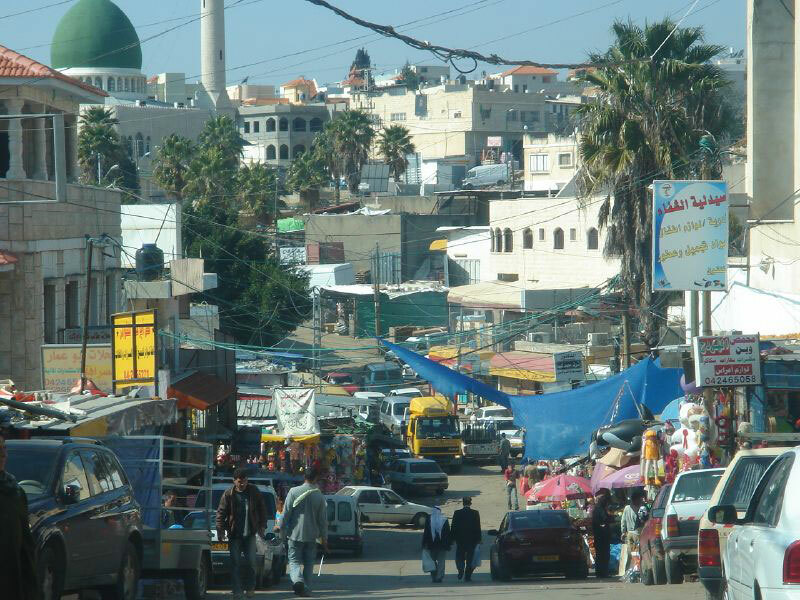 The Arab village of Barta’a is part Israel and part Palestinian territory. We drive through the busy center of town, past the markets selling vegetables and shirts and my cousin says, there, we passed the Green Line—but I don’t feel anything. In the village of Barta’a, a smiley man in a small one-room shop shovels tobacco from low wooden troughs. In the village of Barta’a, the line between citizen and foreigner is so subtle you will miss it if you’re staring at all the cardboard piled in the median of the road. In the village of Barta’a, a man at an outdoor grill blows smoke off his schwarma with a hair blowdryer like he’s been doing it for 500 years. When we return to our rented flat in Jerusalem, after three days in the North, Morgan says, Funny how you can be in a place for any length of time and think of it as home. In the book he thought might be his last, In the Presence of Absence, Darwish recalls a conversation he had with a sculptor friend one afternoon at a café. The friend wanted to make a sculpture of Darwish, something small, something to put next to Darwish’s photo album. But I do not want a sculpture of myself, Darwish told his friend, and moreover, I have no photo album. On the surface, a simple exchange between artist friends, but underneath, two battling ideas about the nature of mortality. 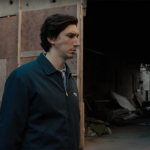 Surprised, he asks: If you die, where will they find you? You say: In my grave. He insists: Why are you against the statue? You say: Because I want to keep moving, to reach out and shoo flies away from my face, to stick my tongue out, to put my feet down in the street. He says: Trust me, I will make movement visible. You say: And I don’t want anyone to break me. I am the one who does that. A statue is incapable of self-criticism. Darwish wanted a home, but he did not want it to be a grave. It’s one thing to be an exile on Earth, quite another to be an exile from Earth altogether. In the lines above, Darwish expresses the universality of his wandering status. Any man or woman, thought Darwish, who tries to dodge Time’s authority with statues or photo albums or nation states is just a sad, thinking donkey. If the donkeys want their immortality, give it to them, says Darwish. I prefer to reach out, keep moving, stick out my tongue. And, moving, Mahmoud Darwish made his home into something that was as restless and lost and self-critical and free as himself. “Israel’ was the new name given to Abraham’s grandson Jacob after his famous struggle with God at the River Jabbok. All alone, without family or possessions, Jacob stood at the riverbank. There, he met a man, and wrestled with him till daybreak. At last, when the sun came, Jacob prevailed against the man. He asked the man to bless him, for he knew that he had met God. It was there Jacob got the name ‘Israel’, which means “one who prevails with God.” So, ‘Israel’ is a spiritual battle. All the Children of Israel are the bearers of a spiritual strife that was given to them by Jacob. The Children of Israel cannot give up until they are sure they’ve won. But at Jabbok, we also note, Jacob lost. Jacob is not the same after his meeting with God, that’s why he needs a new name. Israel is a word of struggle, and it is also a word of surrender. Just like Abraham before him, Jacob must let go of what he knows in return for a beautiful, terrible unknown. Photos by gnuckx via Flickr (Creative Commons), annaspies via Flickr (Creative Commons), TijsB via Flickr (Creative Commons), Neta via Wikimedia Commons, Rahel Jaskow via Flickr (Creative Commons), Gugganij via Wikimedia Commons (a href=”http://creativecommons.org/licenses/by-sa/3.0/deed.en”>Creative Commons), Rawan.nassrallah via Wikimedia Commons (a href=”http://creativecommons.org/licenses/by-sa/3.0/deed.en”>Creative Commons), Roman Catholic Archdiocese of Boston via Flickr (Creative Commons), Claudius Prößer via Flickr (Creative Commons), Mirella Matthiesen via Flickr (Creative Commons), TijsB via Flickr (Creative Commons), David King via Flickr (Creative Commons), David Lisbona via Flickr (Creative Commons), and Jason via Flickr (Creative Commons).